We are one of the widely acclaimed manufacturers and suppliers of Window Sliding Handle for Windows. 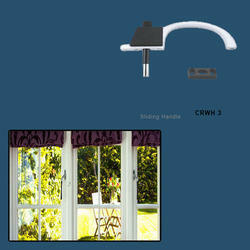 The offered window sliding handle is made for facilitating the sliding motion of windows. Our supplied window sliding handle is highly acclaimed and appreciated by the clients, due to the corrosion resistance and durability. The offered window sliding handle is available at very affordable rates. Looking for Window Sliding Handle for Windows ?